Rejuvenate Jewels has some of the most unique jewellery designs we've come across. They come up with new collections inspired by unconventional items like coins, clocks, wood and more. 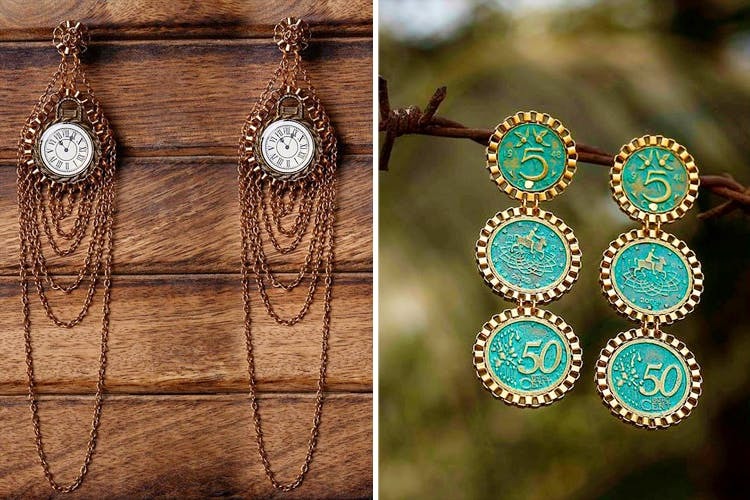 They bridge the gap between precious and junk jewellery with their offbeat products quite well. Their collection are inspired by different items which results in quirky designs that stand out. They've got collections like Heritage which has products inspired by old coins and keys, Timeless that uses clocks and timepieces, and Sawdust, where the pieces are made entirely of wood–yep, you haven't seen stuff like this for sure. The best part about their products is the wearability–you can go through your work and head to the bar at night without having to re-accessorise. Your nine-to-nine look is sorted. They've got golden cord earrings that you can wear with western and traditional outfits, nose rings for daily wear, necklaces for your Insta OOTDs, rings, bracelets, anklets, and more. We wish they had a physical store so we could see and touch the jewellery before buying. They've got an 'Under INR 999' collection for when you want something on a shoestring budget. We say you check it out!